Source of title proper: Title based on the content of the sous-fonds. Eeva Annikki Kantokoski was born May 8, 1924 in Alajärvi, Finland to Matias (Matti) Niilo Kantokoski (born 1901), and his wife Anna Milia (born 1903). The family name was shortened from Kantokoski to Koski, but it is unclear when exactly this occurred. Eeva Annikki and her parents immigrated to Canada in 1924. They arrived in Halifax, Nova Scotia on August 2, 1924, and then settled in Sudbury, Ontario. In December 1925, Eeva Annikki’s brother, Veikko Vesa Matias Kantokoski (Koski) was born. 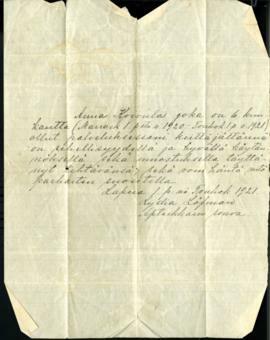 Sometime after their arrival in Canada Eeva Annikki's name was changed to Ann Eva, though others often referred to her as Anne, Anni or Annie. The family's early years were spent in Sudbury, Ontario. After the death of their mother in 1933, Ann and her brother Veikko lived with their father in Sudbury during the summer months and their aunt Ida Marie (Koivula) Lehti in Oshawa during the winter. Ann completed her education in Sudbury, Ontario in 1939, and gained a High School Entrance Certificate, though she did not attend due to the cost. Once she completed her schooling in 1939 she found employment in domestic service for Mrs. J. Ferrier, in Sudbury. Between 1940 and 1941 she worked at Korpela's Grocery Store on Bancroft Drive, and Maki's Restaurant on Elgin Street in Sudbury, Ontario. In 1942, Ann moved to Malartic, Quebec to work in a bunkhouse and kitchen in a mining town. There she met Archie Chisholm, whom she married in Montreal on May 24, 1942. Their first child, Carl Richard, was born on December 24, 1943. When her husband was posted overseas during World War II, Ann returned to Sudbury to stay with relatives, and completed a Red Cross Volunteer Nursing Service course during that time. After the Second World War, Ann and Archie had two more children; Leslie Karen, born March 8, 1947, and Barry Neil, born October 8, 1955. While living in North-western Quebec, Ann contributed her time to the Protestant Elementary School Board and the Canadian Air Force Ground Observer Corps. In 1974, she separated from her husband and moved to Dartmouth, Nova Scotia. There she completed high school and went on to study nursing. She became a Certified Nursing Assistant, and obtained a post-graduate diploma in psychiatric nursing. Between 1976 and 1986 she worked at the Nova Scotia Hospital. Ann Eva Chisholm died on March 12, 2000 at the age of 74, and is buried in Dartmouth, Nova Scotia.